Stay Safe While Working in Hot Conditions Indoors - Solutions Northwest, Inc.
Each year, thousands of workers experience serious illnesses and injury due to hot working conditions. One may think only outdoor workers should be cautious of the heat, but many indoor workers are exposed to heat on the job too. It is important that workers who are required to work in hot environments avoid overheating and other heat related injuries. The obvious occupations that involve hot work environments would be a steel worker in a steel foundry or workers in a boiler room, but there are many jobs that involve high heat environments. For example, bakeries and commercial kitchens require work in high heat. Additionally, distribution warehouses and material handling industrial plants may involve high heat as well. Other high heat environments include: iron foundries, nonferrous foundries, brick-firing and ceramic plants, glass products facilities, rubber products factories, electrical utilities (particularly boiler rooms), confectioneries, commercial kitchens, laundries, food canneries, chemical plants, steam tunnels, and hazardous waste sites. How do you know when you’re overheating on the job? Working in hot conditions could lead to heat exhaustion, heat stress, heat cramps, and more. It is important to recognize the warning signs of heat related injury. Here are a few symptoms to watch for according to the CDC: high body temperature, confusion, loss of coordination, hot/dry skin or profuse sweating, throbbing headaches, rapid heartbeat, heavy sweating, extreme weakness or fatigue, dizziness, nausea, vomiting, shallow breathing. It is the employer’s responsibility to provide a safe work environment. 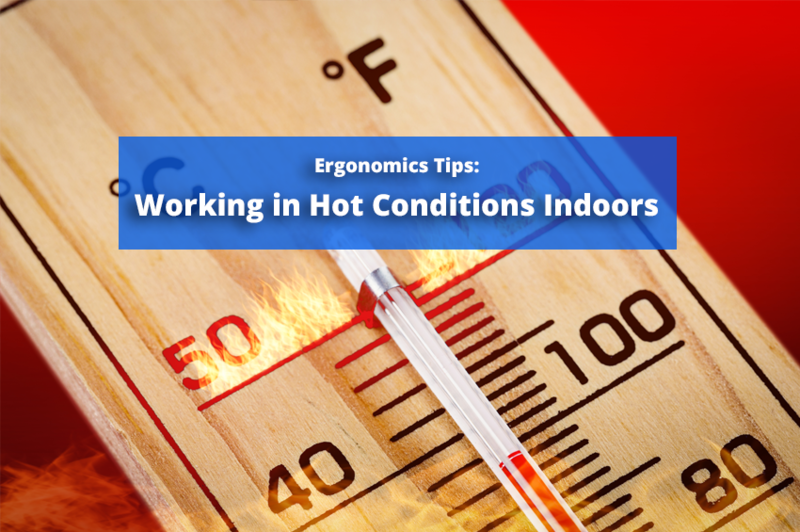 Whenever possible, it is recommended that an ergonomics expert be consulted to evaluate a worksite that is at high risk for heat related injury. Along with proper air conditioning and air ventilation, employers should provide workers with break rooms that contain cool water and a place to rest. Workers should take turns taking water breaks, providing relief workers or extra workers will make this a more practical practice and will reduce the physical demands of being understaffed. Additionally, newer workers should be eased in to working in hot environments. New employees should be exposed to hot work environments in stages, slowly becoming acclimated to the hot conditions over time. Knowing the warning signs, along with plenty of rest and plenty of water is truly the key to avoiding heat related injury. For more depth and detail, contact one of our ergonomics experts for a consultation. As always, be sure to subscribe to our blog for more ergonomics tips from Solutions Northwest Inc., ergonomics consultants located in Washington State, Renton, Kent, Northern California, Oregon, Seattle, Olympia, Tacoma, and Portland.